I do not think I would have even posted pictures of myself it it wasn’t for such a supportive sewing community! 😀 I have all kinds of sewing plans now! I think Twitter is awesome! And yeah- temptation a plenty! And you look pretty too. It’s great that you’re taking the right steps to enjoy who you are now. Thank you. 🙂 I decided NOT to wait til I was that “perfect” weight … so yes, I am doing my best to enjoy who I am now! Aw, you should feel pretty, you look gorgeous in this dress. Great job! I have just begun to sew with knits and have a question. What does ITY stand for? Thank you! Here is a great article on ITY knits- http://www.marcytilton.com/item.php?pid=2295&cid=905 … ITY means INTERLOCK TWIST YARN. They sure are FAB! You look great! I love your new dress. I loved this post. I remember going through a stage when I felt lost and I realised ‘me’ had disappeared and I was ‘mum’, ‘wife’, ‘daughter’, ’employee’ etc. there is absolutely nothing wrong with sewing for yourself or simply sewing because it makes you happy – in fact it’s the best reason of all to sew. Love the dress, the colours are gorgeous! I sooooooo understand your feelings 🙂 I am happy you are starting to find yourself again. When I was pregnant with my four children, I gradually gained weight. I was never totally humongeous, but it was too much, and I did not recognize myself. I was like you, I did not like myself. I am so glad to hear that you are finding the way back to discovering YOU!!!! No matter where you are allong your path, you are butiful and you might as well look your best. You look lovely. And very happy! I agree with you on jersey, it’s wonder-stuff and, unlike other textures, the fabric doesn’t seem to date. My working life means I have very little by way of routine so my weight fluctuates – bit of stretch in my clothes helps! This design really looks awesome on you, looking forward to seeing it in the cherry-red! Thank you! I am excited to see the cherry red too- have decided after I finish my Carnivale costume I will make that one. I have felt so much better about myself since I began sewing for me. Retail made me feel like my body was impossible and wrong. 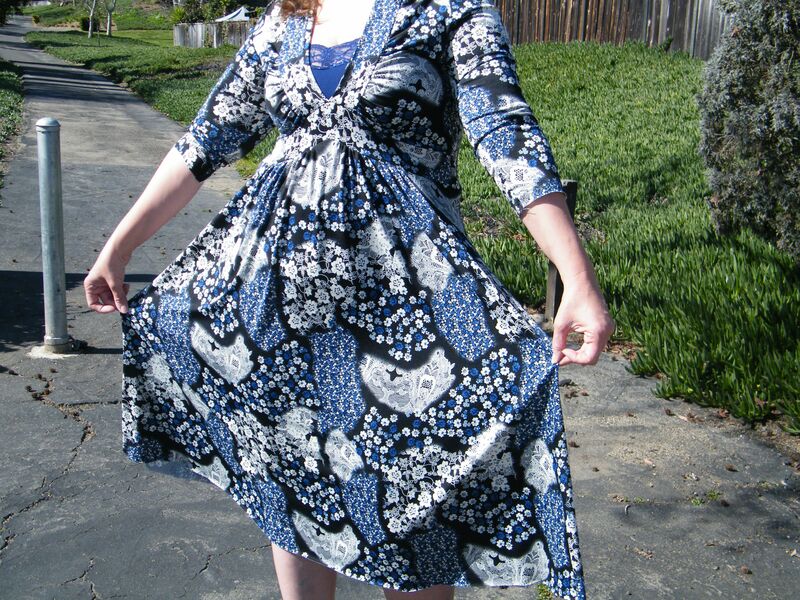 I love this dress on you- think I will buy some knit ….and a cami! I am realizing that retail clothing is impossible and wrong! Not US! …. YOU could skip the cami if you don’t have a disapproving daughter lying in wait! I do like to keep the bunnies in the hutch usually, but…..
Gorgeous dress! I think it was only once I started sewing for myself that I began to feel comfortable with my shape, and that was after baby no.2. I never looked the way I was supposed to in shop bought clothes. Now I know that it was the clothes that were shaped wrong, not me. However I am the opposite to you in that I am way too selfish to spend my valuable time sewing for other people. So wonderful that you are sewing for you again. I totally have walked your walk – after 3 kids! I gave up trying to look perfect and decided that I just needed to be HEALTHY, regardless of what my measurements were. The AHA moment came while doing a concert about a decade ago: In the audience was a much older woman than I was at the time, impeccably dressed with clothes that *fit properly*. She wasn’t the “ideal” in terms of size, but she was so beautifully put together and looked so comfortable with herself that I decided then and there that I would learn to alter patterns and sew up clothes that fit me, as I am right this very moment, and focus on healthy living. And I’m so happy to see you in that dress, because I’ve been wanting to make this dress but got stalled on the very low neckline. It’s gorgeous – the print is beautiful! 🙂 And YES! Being healthy is the key. I am learning to be happy with myself and am excited about having clothes that fit and flatter! – Definitely make this – I actually like the cami top peeking out although I MAY try a version with an adjusted neckline as well. Thank you- I do love the print as well! This dress is sooooo pretty!! 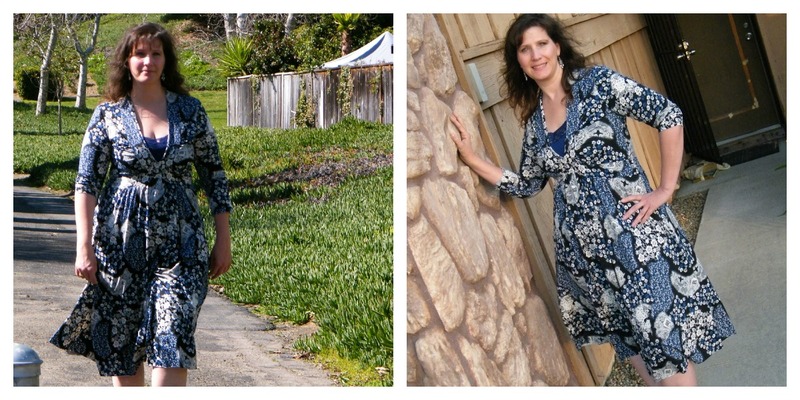 It’s a very flattering style & the print is GORGEOUS!! Thanks so much.. 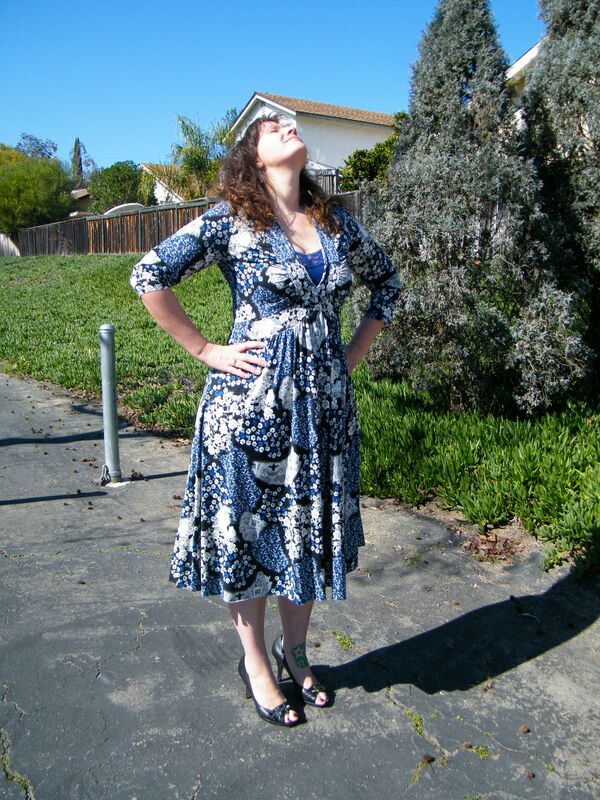 I love the dress and can’t wait to make another!